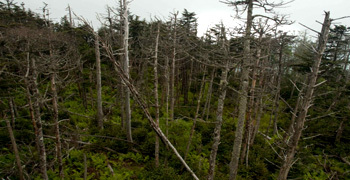 Trees affected due to Acid rain Acid rain looks, feels, and tastes just like clean rain, but why it is harmful? Let's try to figure out the effects of acid rain. What is meant by Acid rain? Acid rain is a form of precipitation which would be acidic and undesirable. It contains high levels of hydrogen ions which are harmful to plants, aquatic animals and even damage the infrastructure. Acid rain consists of water droplets that are unusually acidic because of atmospheric pollution – most notably the excessive amounts of sulfur and nitrogen released by cars and industrial processes. Acid rain is also called 'acid deposition' because this term includes other forms of acidic precipitation such as snow. Acid rain is a uniquely human–related phenomenon. The term “acid rain” is commonly used to mean the deposition of acidic components in rain, snow, fog, dew or dry particles. Scientists have discovered that air pollution from burning of fossil fuels is the major cause of acid rain. 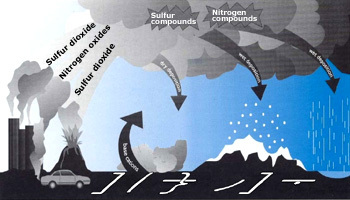 The main chemicals in air pollution that create acid rain are sulfur dioxide (SO2) and nitrogen oxidises(NOx). The burning of fossil fuels (coal and oil) by power–production companies and industries releases sulfur into the air that combines with oxygen to form sulfur dioxide (SO2). Exhausts from cars cause the formation of nitrogen oxides in the air. From these gases, airborne sulfuric acid (H2SO4) and nitric acid (HNO3) can be formed and be dissolved in the water vapor in the air. Although acid–rain gases may originate in urban areas, it is often carried for hundreds of miles in the atmosphere by winds into rural areas. That is why forests and lakes in the countryside can be harmed by acid rain that originates in cities. The atmosphere deposits a lot of toxic metals into the forests because acid rain contains metal. Some of these metals are lead, zinc, copper, chromium, and aluminum. When there is acid rain, the rain releases these metals. This is believed to stunt the growth of many trees and plants. Eroded monument due to acid rain It is not only harmful to plants and animals, but also can have devastating effects on older buildings and statues made from certain types of stone. Acid rain can increase the acidity of lakes, dams and streams and cause the death of aquatic life. It also increases the acidity of soil, water and shallow groundwater and contributes to damage of trees at high elevations. Acid rain erodes buildings and monuments. Acid particles in the air are suspected of contributing to respiratory problems in people. In addition, acid rain accelerates the decay of building materials and paints, including irreplaceable buildings, statues, and sculptures that are part of the nation&apos;s cultural heritage. Prior to falling to the earth, SO2 and NOx gases and their particulate matter derivatives, sulfates and nitrates, contribute to visibility degradation and harm public health. Dry and wet deposition of acid rain When the particles are deposited by wet deposition, the particles are scavenged by snow, rain drops, and other methods of precipitation. In dry deposition, the causes of the deposition can be sedimentation, interception, impaction, diffusion, turbulence, or one of several other causes. What are the different types of acid rains? (1) Dry Deposition: In dry weather areas, the acid chemicals may become incorporated into dust or smoke and fall to the ground through dry deposition, sticking to the ground, buildings, homes, cars, and trees. Dry deposited gases and particles can be washed from these surfaces by rain storms, leading to increased runoff. This runoff water makes the resulting mixture more acidic. About half of the acidity in the atmosphere falls back to earth through dry deposition. (2) Wet Deposition: Wet deposition refers to acidic rain, fog, and snow. If the acid chemicals in the air are blown into areas where the weather is wet, the acids can fall to the ground in the form of rain, snow, fog, or mist. As this acidic water flows over and through the ground, it affects a variety of plants and animals. The strength of the effects depends on several factors, including how acidic the water is; the chemistry and buffering capacity of the soils involved; and the types of fish, trees, and other living things that rely on the water. pH scale to measure the acidity level in acid rain. 'Normal' or 'unpolluted' rainwater has a pH of 5.6. Acidified rainwater can have a pH of 4, which is about 30 times more acidic than normal rainwater. How do we measure acid rain? 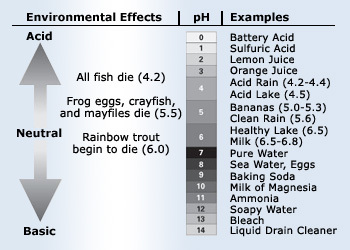 Acid rain is measured using a scale called “pH”. The lower a substance&apos;s pH, the more acidic it is. Pure water has a pH of 7.0. Normal rain is slightly acidic because carbon dioxide dissolves into it, so it might have a pH of about 5.6. Acidified rainwater can have a pH of 4.0, which is about 30 times more acidic than normal rainwater. How to reduce Acid rain? 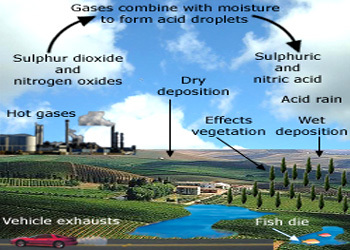 Acid rains occur primarily due to the SO2 and NOx emissions from the fossil fuel vehicles. If we try to reduce these emissions by using other alternative sources of energy, then the amount of acidity in the rainfall would reduce. The are other sources of electricity besides fossil fuels. They include: nuclear power, hydro power, wind energy, geothermal energy, and solar energy. Of these, nuclear and hydro power are used most widely; wind and solar power generation is catching up. Acid rain in various parts of the world. Scientists today are convinced that acid rain is severe in many areas, and that it is having an adverse effect on the environments of those locations. 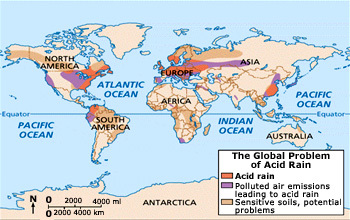 What are the countries that are affected by acid rain? Countries that are mostly affected by acid rain include United States and Canada mostly because of high numbers of factories, power plants and large numbers of automotive plants. Poland, Germany, Czech Republic, Sweden, Norway and Finland in Europe and India and China in Asia, are mostly affected mainly because of the large numbers of factories. According to research, China produces the most acid rain. The amount of acid rain produced is in direct relation to the amount sulfur dioxide that is produced by the particular country. Sometimes, it is not always the country that produces the pollution that ends up suffering from the acid rain. 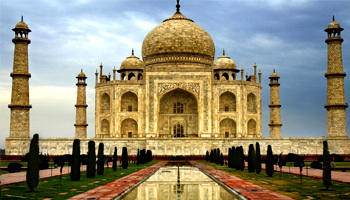 Taj Mahal discolored Acid rain reacted with the marble (calcium carbonate) of Taj Mahal and caused damage to the wonderful structure, which had attracted many people from different parts of the world. Acid precipitation affects stone primarily in two ways: dissolution and alteration. When sulfurous, sulfuric, and nitric acids in polluted air react with the calcite in marble and limestone, the calcite dissolves. 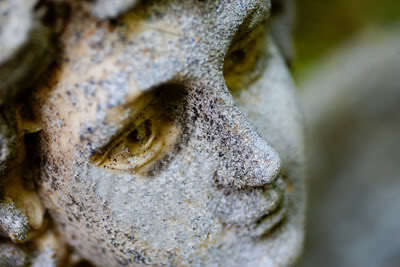 In exposed areas of buildings and statues, we see roughened surfaces, removal of material, and loss of carved details. Stone surface material may be lost all over or only in spots that are more reactive. You might expect that sheltered areas of stone buildings and monuments would not be affected by acid precipitation. However, sheltered areas on limestone and marble buildings and monuments show blackened crusts that have spalled (peeled) off in some places, revealing crumbling stone beneath. This black crust is primarily composed of gypsum, a mineral that forms from the reaction between calcite, water, and sulfuric acid. Gypsum is soluble in water; although it can form anywhere on carbonate stone surfaces that are exposed to sulfur dioxide gas (SO2), it is usually washed away. It remains only on protected surfaces that are not directly washed by the rain. Gypsum is white, but the crystals form networks that trap particles of dirt and pollutants, so the crust looks black. Eventually the black crusts blister and spall off, revealing crumbling stone.